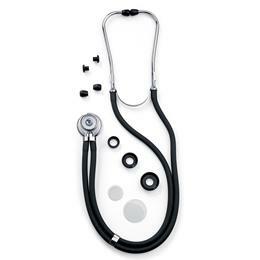 The Sprague Rappaport Stethoscope Is A Great Combination Of Quality And Value. The Dual-Tubing Design Transmits The Faintest Of Sounds. Versatile Because Each Stethoscope Comes With A Component Kit That Includes Two Sets Of Eartips, Large And Small Diaphragm And An Adult, Pediatric And Infant Bell. Hunter Green.